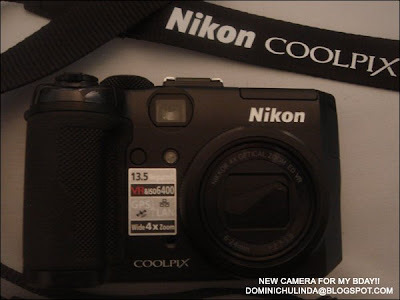 Dominichulinda | A Random Blog(ger): Nikon Coolpix p6000 Early Bday Gift!! Nikon Coolpix p6000 Early Bday Gift!! I got a camera for my BDAY!!! yay!! and $$$. Which I was suppose to spend on the "Sugar Sweet" Collection..I ended up going to the CCO Store! The Nikon Coolpix P6000 Digital Camera takes precision and creativity to another level. The camera's superb image quality is guaranteed by an effective 13.5 megapixels, the wide-angle 4x zoom NIKKOR lens including 2 ED glass, an optical vibration reduction (VR) lens and a maximum ISO of 6400 to ensure low-light situations are no excuse for a missed photographic opportunity. Underneath, the Nikon EXPEED image processing engine produces fast response times, clean and sharp images without any compromises.